Shows Finisterre, the ultimate end to the Camino de Santiago or the Way of Saint James. De Zeecusten van Galissen tusschen de Cabe Ortegal en Finisterre. 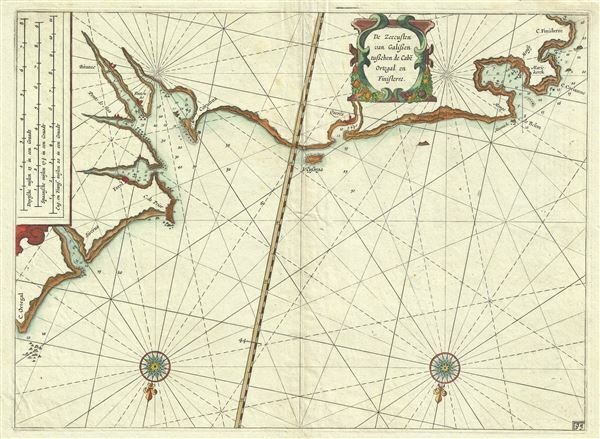 This is a beautiful c.1623 Willem Blaeu map or nautical chart of the Galician coast of Spain. This maritime map covers the northwestern Spanish coast from Cape Ortegal to Cape Finisterre. It offers numerous rhumb lines, depth soundings, and some inland topographic detail. The Island of Sisarga (Cysarga) is identified. Important coastal towns and cities are also noted. Cape Finisterre, sometimes mistaken to be the westernmost point of the Iberian Peninsula, is for most pilgrims, the final destination of the 'Way of St. James,' the pilgrimage to the shrine of St. James in the Santiago de Compostela Cathedral. It is here at Cape Finisterre where pilgrims traditionally burn their clothes and boots at the end of the pilgrimage. The map contains two compass roses. This map was issued in 1623 as page no. 93 in Willem Janszoon Blaeu's Blaeus Zeespieghel. Blaeu W. J., Blaeus Zeespieghel, 1623.